This is a review of the Aug. 7, 2014 Federal Primaries for Tennessee. 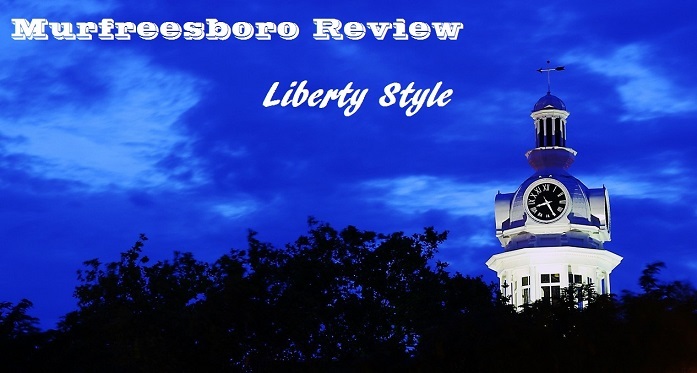 For a review of the Aug. 7, Rutherford County Primaries and County General Election, see here. Wow, the Aug. 7th, 2014 Republican Primary really turned out to be a nail-biter. From the U.S. Senate & House, to state and even local races, I feel this year's primary is one for the books. I want to spend some extra time discussing the race for Senate and House District 4 before moving on to the more local campaigns, so I've divided this review into two parts. The second will cover the local, county-centric races. For Rutherford County, early and absentee voting accounted for 53.8% of votes cast. There were a total of 32,675 votes cast (includes GOP and Democrat voters) and voter turnout was 21.3% (based on the latest figure of 153,107 registered voters). There was no real attempt to challenge Bill Haslam for governor and he ended up winning around 86% state-wide (84% for the county). What I find amusing is that Mark "Coonrippy" Brown came in 2nd, earning 8.16% of the vote in Rutherford County, and about the same across the state. While the final campaign financial reports aren't in, we can see from the FEC reports up to July 18 that this was a very expensive primary, with at least $9,056,790 raised and $6,654,165 spent (equaling $10.01/vote). Lamar actually won one precinct in Rutherford County, precinct 14-1. He won by five votes out of 1,248 cast. Given Alexander's long history in the state and the fact that he's had basically a state-wide campaign machine for decades, there was little doubt as to who would win the primary. That said, the fact that he won with less than 50% of the vote sends a clear message that Tennesseans are tired of career politicians and desire real change and real conservative leadership. His primary showing was nearly 15 points lower than in 2008. What is surprising, is how close Joe Carr really came (within 9%), generally overcoming his duel handicaps of low name recognition and comparatively small finances. Not to mention he won Davidson County and nearly doubled Lamar's total in Rutherford! Carr also came within 2% or less of winning Cumberland, Fayette, Gibson, and Giles counties, and was within 5% in 2 other counties. We can only hope that this will spur Lamar into being a somewhat more conservative Senator, and we should remind him of how dissatisfied Tennesseans are with him to help him make the right choices. This race was another hotly contested race with 6 candidates all vying to unseat Scott DesJarlais. 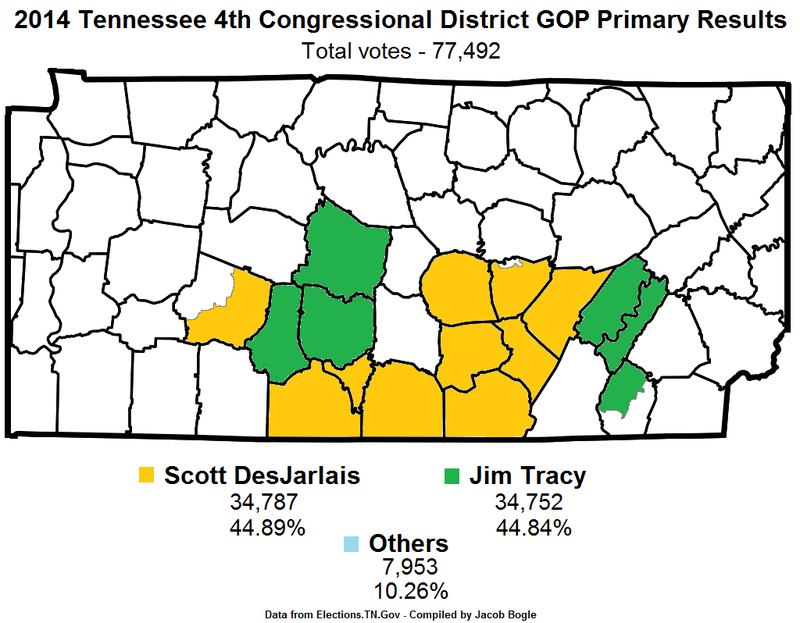 I feel people under and over estimated (in different ways) both DesJarlais and his main competitor, Jim Tracy. Some thought DesJarlais would easily win because of his conservative record, but once you look at it you find it isn't very conservative at all. Others thought Tracy would easily win because he far out raised DesJarlais, but with Jim too, his support for Common Core and his wishy-washy stances on other issues knocked him down a few rungs. Tracy also underestimated how non-relevant DesJarlais' past scandals were while he seemed to hinge his whole campaign on "integrity". The end result is what has to be the closest congressional primary in 4th District history (if not the whole state). At last check, DesJarlais was up by a mere 35 votes. The other candidates raised less than $5,000 each and were not required to file FEC reports. Based on the four above, the candidates brought in $1,928,719 and spent $1,519,038 ($19.60/vote). There were 77,492 total votes which was far greater than the 2012 primary in which 47,015 people voted (an increase of 64.8%). For Rutherford County, 24,164 people voted in this race, up from 13,646 in 2012 (an increase of 77%). Although DesJarlais was soundly beaten in Rutherford County, he did win in the following seven precincts: 1-1, 5-2, 8-2, 9-1, 10-1, 17-2, and 19-1. As with Alexander, DesJarlais won with less than 50% of the vote; the "anti-Scott" vote was 55.1%. Compared to the 2012 primary, Scott fell nearly 32 points. The tightest vote came from Meigs County where Tracy won by 16 votes. This narrow win can give us enough leverage to nudge DesJarlais into making the right decisions, and we must do all we can to hold him accountable. I do believe DesJarlais has our interests at heart, despite some very bad votes of his in the past. And because of this, he would be more likely to listen to the people of the 4th District if we would only help guide him. His votes for things like government spying, corporate welfare, subsidies, and the unconstitutional detention of American citizens cannot be tolerated and they must not be repeated.